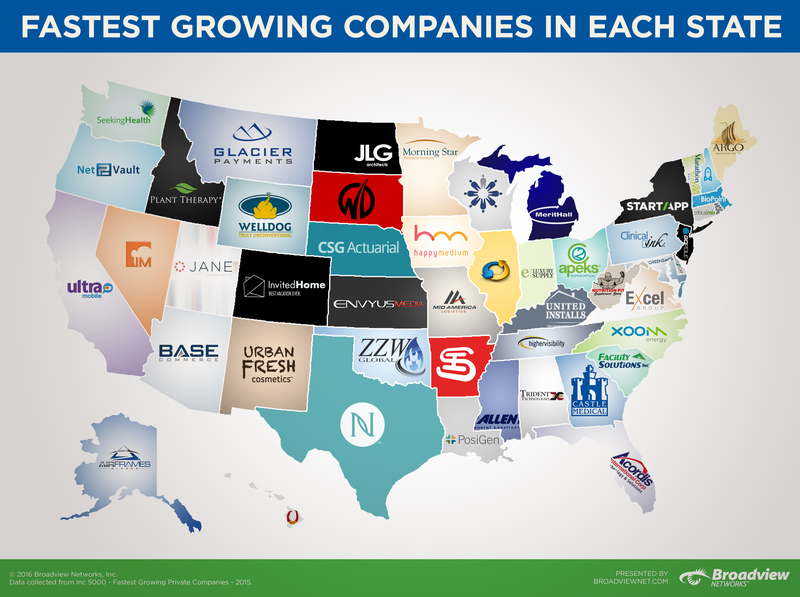 Remember last year’s map of the fastest growing companies in each state? We liked it so much that we decided to update it based on Inc. Magazine’s 2015 Inc. 5000 list. This year we noticed significant growth in young healthcare companies, and of course software and IT are on the rise as well. While Broadview focuses on the cloud-based business phone systems corner of the market, watching these other successful companies gain momentum in revenue, clients, services offered, and employees reminds us of the ever-growing need for scalable cloud-based IT solutions. Add to that the modern necessity of employee mobility, and you’ll understand our commitment to creating the best communications strategies possible. For the map, we combed through Inc.’s list of companies, found the fastest growing business in each state, and put the company’s logo on the map for you. Take a look and let us know what you think! Source: 2015 Inc. 5000 The information contained in this website is for general information purposes only. The information is provided by Broadview Networks and while we endeavor to keep the information up to date and correct, we make no representations or warranties of any kind, express or implied, about the completeness, accuracy, reliability, suitability or availability with respect to the website or the information, products, services, or related graphics contained on the website for any purpose. Any reliance you place on such information is therefore strictly at your own risk.